All empires collapse eventually. There have been no exceptions in the history of mankind. Their reign ends when they are defeated by a larger, more powerful enemy, or when their financing runs out, resulting in collapse. History is replete with the rise and fall of empires. Are Americans so arrogant, or oblivious, to realize that we are in a stage of decline and collapse? Some of the signs of decline include a downward cultural spiral, an over-reliance on government and the inability to protect the integrity of a nation's borders. Sound familiar? ©2016 Brahmin Merchandising Inc. (P)2016 Brahmin Merchandising Inc.
Getting past the lengthy introduction is a substantial chore. When we finally drill down to book material bedrock, Akart provides a thumbnail sketch of a few of the major civilizations of the ancient world and the panoply of reasons for their ultimate decline. 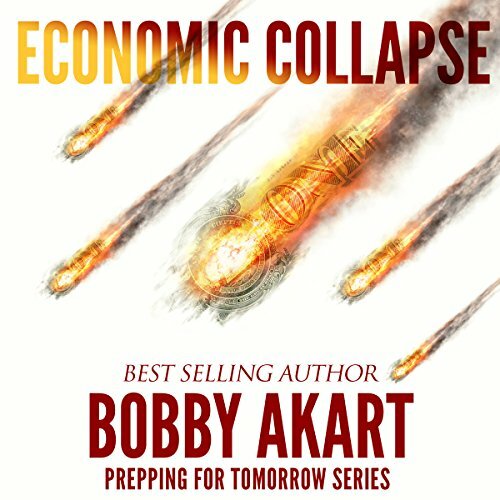 He provides a fairly comprehensive explanation of economic jargon such as GDP, recession, stagflation, etc., then numbs us with a recitation of the comparative rates of inflation for what seems like a list of all 205 (give or take) of the world's sovereign nations. His hard right conservative outlook sharply disapproves of social welfare safety nets and has harsh words for governments that invest in infrastructure as a means of reviving a sagging economy. He has no investment strategies, advising only that people keep cash, and lots of it, in some unspecified location that is not a bank. He stops short of suggesting that one bury the money in the garden, but this seems to be his unspoken recommendation. His nightmare scenario of a world in chaos advises that prudent citizens arm themselves for the specific purpose of killing those who might try to grab their stash of food and supplies. Akart is addressing a very specific segment of the population, a group that will embrace his philosophy with enthusiasm and bullets. The rest of us can't go wrong by stocking up on a little extra food, some bottled water and a few batteries.